I watched a great film a few years ago and recall this inspiring scene but I couldn't remember the title. So I googled "movie, field of sunflowers, road trip, collector, wall of boxes" and up came the title. Phew! I love that. 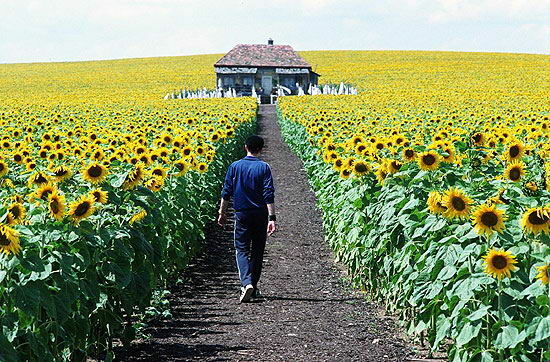 Ever since I saw the film Everything is Illuminated I've fancied a huge field of sunflowers around my house. Not really practical, digging up the lawn for sunflowers, but what a beautiful summer you would have. Every spring I manage to plant a few sunflowers in the garden, although nothing on this scale. This year I'm dreaming big. There are plenty of scrappy spots in the garden I could turn into a mini field of sunflowers. The seeds have arrived. I just need to prepare some beds and start sowing. Let's see what happens. Do you like sunflowers? Have you seen Everything is Illuminated? I loved it! I haven't seen it but have been meaning to read the book for ages. Can't wait to see your field of sunflowers. I have memories of camping in France as a youngster and getting lost in rows and rows of sunflowers ... so beautiful. I'm organised this year and already have some sunflower seedlings coming up in my front yard, which I have also planted out with artichokes! I haven't seen that film, I must look out for it. I haven't seen the film but every year we buy 5 kilos of sunflower seeds and plant them on mass in the paddock. When we used to run the farm stall we used to pick an arm full for each customer. OMG Kate! That sounds gorgeous! A friend and I once had amazing adventure in a sunflower paddock and ever since then they have reminded me of her. They light up my day and I would love to have them surrounding my house! Fields of sunflowers are so beautiful. No space here for a field scale but I'll have to pop a couple in to enjoy their happy faces. I love that image, I would never want to close my eyes. I look forward to seeing your sunflower beds, we planted up along our back fence just the other day. Good luck hope they are spectacular. A home surrounded by sunflowers sounds like the greatest idea. I do love them as well and while I missed the window for having them this year I plan to plant them every year after. We chose to have them as "our" flower for our small wedding recently as well so they'll always hold a bit of a special place in my memory. Such a fantastic film, and book! Great imagery in it! Have you heard of The Fall? That movie is full of visual eye candy! I love fields of sunflowers. Last fall I was in Italy and my friend and I were cruising around Tuscany and came upon ACRES of sunflowers! Just football field after football field and so on! It was stunning. or the birds eat them. remember the days before google and waking up in the middle of the night with the 'ta-da' moment remembering that weird fact that you couldn't remember at the ace dinner party you were having with your besties only to have forgotten again by morning. and imma gonna look up that movie! My sunflowers are only about an inch high seedlings so far. I missed them at our last house and couldn't wait to grow them in our new garden. I only have five planted for now, but I want to plant a whole heap more so that I can have, at least for one week, a HUGE vase full of sunflowers on my dining table. Doesn't that sound lovely? i loved the movie too and oh my goodness that field of sunflowers, amazing. cannot wait to see how you go with yours.